Robert Michael Mischak was born October 25, 1932 in Newark and grew up in Union. Bob was an excellent student. He was bright and inquisitive, always wanting to dig deeper on a subject or understand the complex ways things worked. He also was a tremendous all-around athlete. He was fast, smart and coachable regardless of the sport he played. He was also a natural leader. Bob played fullback for Union High School and was the object of area recruiters, including Vince Lombardi, who was a member of Red Blaik’s coaching staff at the U.S. Military Academy. Bob thought a career in the military—and a chance to play for Army—sounded like a good deal, so off he went to West Point in 1950. Coach Blaik admired Bob’s speed and soft hands, and switched him to tight end. He also played on the defensive line. Bob became a team leader during a dark era for Army, when a cheating scandal rocked the academy. As a senior in 1953, Bob made a play against 7th-ranked Duke at the Polo Grounds that saved 17–16 victory. He ran down Red Smith from behind in the open field—just before he crossed the goal line for the would-be winning score—after Smith broke free on a double-reverse. The video of the play is online and still jaw-dropping. 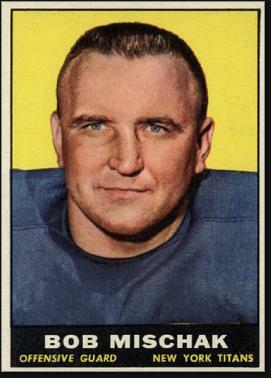 Bob was selected by the Cleveland Browns with a late pick in the 1954 draft. They retained his rights while he fulfilled his military obligation, and then traded him to the Giants in 1958. There was no room for him as a tight end in New York, but Lombardi was the team’s offensive coordinator, and he gave Bob a crash course on how to play guard. Bob played right guard for the Eastern Division champs and actually caught a 27-yard pass from Charlie Conerly on a play where he lined up as a tight end. Little did anyone realize that, by manning the guard position with a tough, mobile player, Lombardi was beginning to develop his idea for the Green Bay power sweep. Bob did not play in 1959 due to an appendectomy, and worked for New Jersey Bell instead. He thought he could do without football, but realized while working as a repairman that he missed the game. With the creation of the American Football League in 1960, Bob got a new lease on his football life. John Dell Isola, a star for the Giants in the 1930s and a coach with the team in 1958, was now part of Sammy Baugh’s coaching staff on the New York Titans. He worked his connections to lure several second-strings across the river to the Polo Grounds—including Don Maynard, Thurl Cooper, John McMullan, Roger Ellis and Bob. Bob joined the Titans and was named team captain. He anchored the offensive line and was named to the All-AFL squad each year he played for the Titans, from 1960 to 1962. His favorite line about the sparse crowds at Titans games was that the team should dispense with pre-game introductions and just have the players shake hands with the fans individually. Bob was treated by his fellow players as a de facto coach. In 1962, he actually taught rookie Larry McHugh how to play his position—making Bob expendable in 1963. 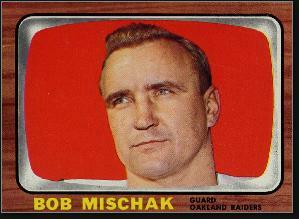 Bob played three more seasons in the pros with the Oakland Raiders. He retired as a player in 1966 and took a job coaching at Army. A few years later, Bob was hired by John Madden as an assistant. He coached the Raiders’ tight ends for almost two decades in the 1970s and 1980s. He tutored Dave Casper and Todd Christensen, among others, and picked up three Super Bowl rings. Later, he coached Arena Football and worked to get the World League of American Football going overseas. Bob passed away at age 81 in the summer of 2014.